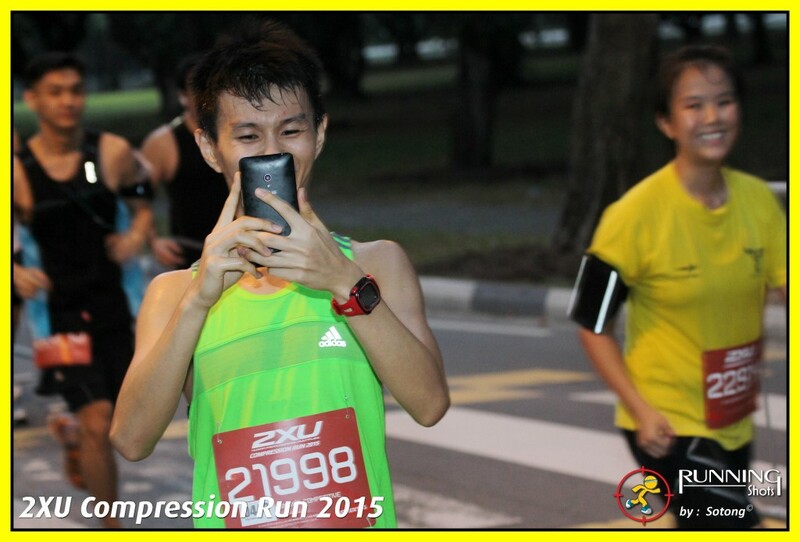 Race Review: 2XU Compression Run 2015 [21km] (by Moses) | JustRunLah! A little disclaimer: I didn’t sign up for this race. 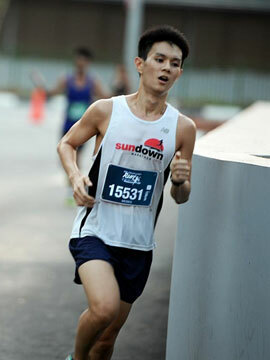 Instead, the race bib (albeit one of the opposite gender) was given to me the day before the race. To minimise inconvenience in the case of an emergency, I had ensured that the details on the race bib (such as my blood group) were accurate. Having decided to treat this as a fun run instead of a race (if you wish, there’s a little more information on my personal blog here), I thereby knew I wouldn’t end up threatening a female podium finish (which has happened before when males wear female bibs) and causing unnecessary trouble. Having mentioned the above, let me dive into the review in which I’ll try my best to provide an objective appraisal of my experience. As always, look out for the font in italics as I’ll try to highlight some of the aspects that I believe participants would agree are important. Well, you’d probably have figured that as I was given this bib, I didn’t actually attend the Race Entry Pack Collection hence I cannot provide any first-hand comments on the above. Having said that, I know that this race was postponed from the original date in March 2015. The organisers catered for runners who were not participating on the postponed date (2 August 2015), either by choice or by circumstance, to collect their finisher’s entitlements at other occasions. Honestly, I was a little hesitant about completing a half-marathon. After all, I had the privilege of only knowing about and receiving this free bib barely 12 hours before the flag-off. 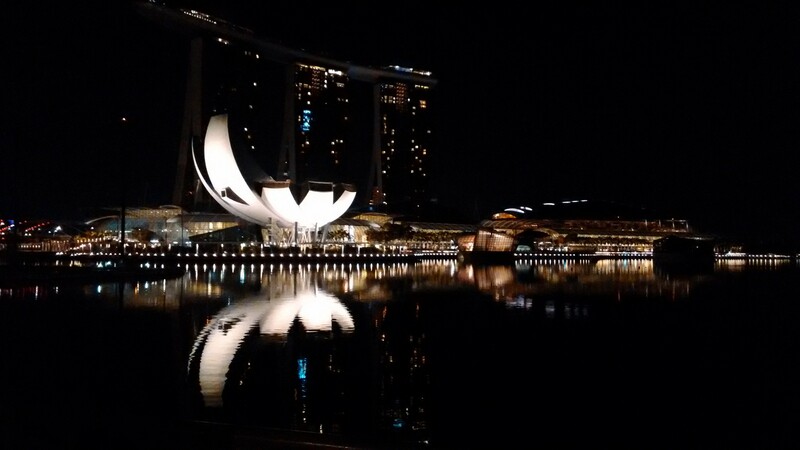 I did have plans to run near Gardens By The Bay, though I certainly wasn’t intending to cover such a distance. Nonetheless, knowing that I was treating this as a fun run (which probably wasn’t as fun when I ended up spending lots of time on my feet), I was prepared to enjoy the local running atmosphere. 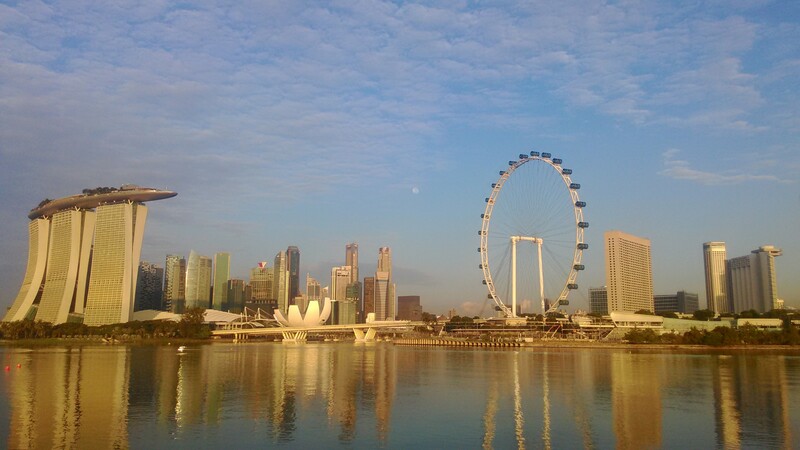 It was awfully time-consuming travelling to the race precinct by the free shuttle service from The Float @ Marina Bay. Despite arriving at 3.40am, it was only around 4.15am that we managed to board the buses after negotiating the snaking queue. Honestly, it didn’t look very organised, with a significant potential for individuals to jump the queue if they wished. Furthermore, it wasn’t easy to estimate how long queuing would take (for those that may have considered jogging to the precinct instead of waiting). Perhaps an illustration (pretty accurate at the point when I was queuing) would provide a better explanation. Yes…I’m pretty certain this is an accurate representation. 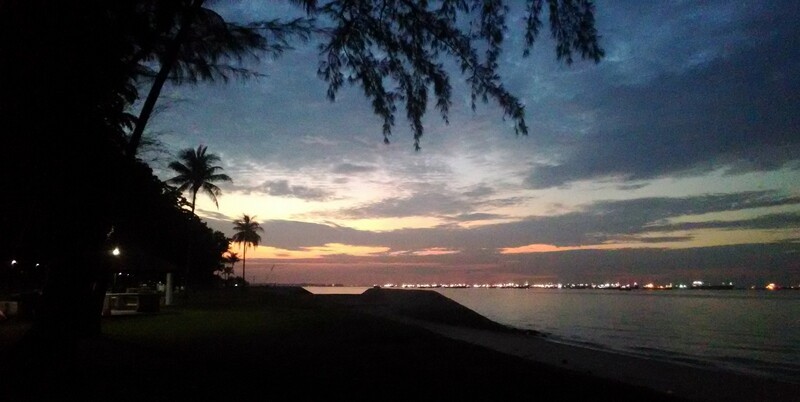 It was about 4.25am when we arrived near Marina Barrage by shuttle. Participants were then required to negotiate another few hundred metres before reaching the race precinct. The ground felt pretty clumpy (the way newly planted grass feels) hence in the darkness, that could be hazardous. I hurried to the baggage deposit, which was fuss-free. By that time, the first wave had already been flagged off. Due to my rather unique race plan (details available here), I skipped the restroom (someone put it this way “the only thing longer than the queue for the shuttle bus was the queue for the female restroom” – although I suppose as a guy, my visit would have been considerably shorter:D) and headed straight towards the start pen. I managed to sneak (legally) into Wave 3, which was flagged off around 4.50am. Admittedly, since I had started at a steady pace and this wasn’t Wave 1, it wasn’t long till I found some clear space to run. That was until, I met the runners of the earlier wave(s). From then on, the crowd was quite consistent until the U-turn point (9+km). I suspect for runners running around 5min/km or slower, the race route would have been acceptable to run along even if one did not start in the first wave. However, any faster than that and the risk of collision with other participants would be pretty significant due to the considerably narrow width accommodating the sheer number of participants (about 9000 half-marathon runners). Other than the congestion, the route was pretty flat and it had minimal turns. 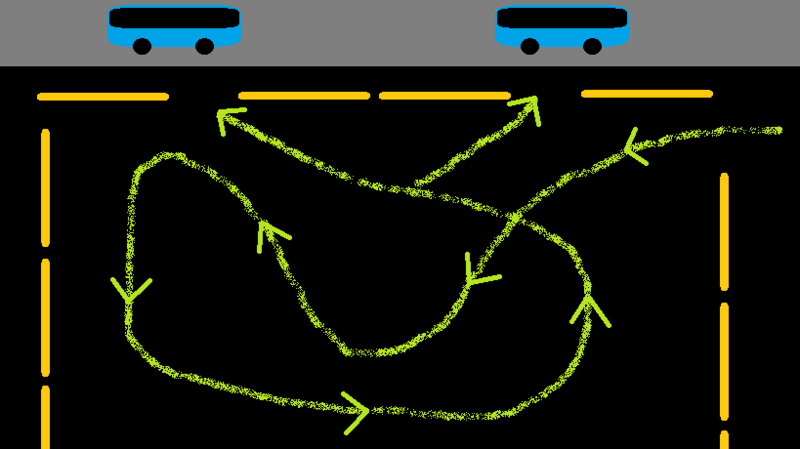 It’s notable that there were however, a few steps to be negotiated on the return journey, when the route merged into East Coast Park Service Road. Capturing a photo of one that captures photos of us. Credit to Running Shots. I have no complains about the hydration points, with all 10 except one (according to my observations) serving both water and Pocari Sweat. The volunteers (particularly as I got to the later hydration stations and the crowd had increased) were working tirelessly, many kudos to them! It would have been nice if there was some form of nutrition provided, such as energy gels. Distance markers were also present throughout the race. Well, except at, ironically, the 20km mark. Imagine the sheer agony of runners at that point of time 😯 Anyway, the markers corresponded pretty accurately to my Garmin Forerunner 15’s auto-lap every kilometre until I decided to venture off course after 12km~. My Strava data is accessible, though you may realise I didn’t exactly stick to the route. As a vast amount of the route took participants along East Coast Park, restrooms were plentiful and were frequented (from my observation) by a sizeable number of participants. On a random note, there was a rooster crowing as I was heading out towards the U-turn point…and presumably the same rooster was still crowing while I was returning to the finish. The little moon doesn’t wanna miss out the fun. There were various forms of post-race activities available. Though I didn’t quite get involved in most, some of them included a booth with free ERDINGER Alkoholfrei beer, 2XU towel give-aways, Finisher-tee size exchanges, an Instagram photo booth and an inflatable rock wall, amongst other things. With that, I conclude this review and hope it was an informative and perhaps, an enjoyable read. Feel free to check out my personal blog here. Thanks. Unfortunately I’ve no idea, though are you referring to this year’s or last year’s edition on the race?